Accelerate the benefits of Google Cloud with Informatica. Abstract multi-cloud complexity with powerful, GUI-driven tools to seamlessly integrate Google Cloud with the rest of your data landscape. Informatica’s market-leading solutions for cloud application and data integration and pervasive, high-performance connectivity will take your application development and cloud analytics with Google Cloud to the next level. You want to integrate your on-premises data and applications with your SaaS and cloud application and do so in real-time using an API-first strategy. Did you know that Informatica’s iPaaS (integration platform as a service) is the #1 platform in the market for connecting your on-premises and cloud data and apps using data integration, application integration, and provide and consume APIs? 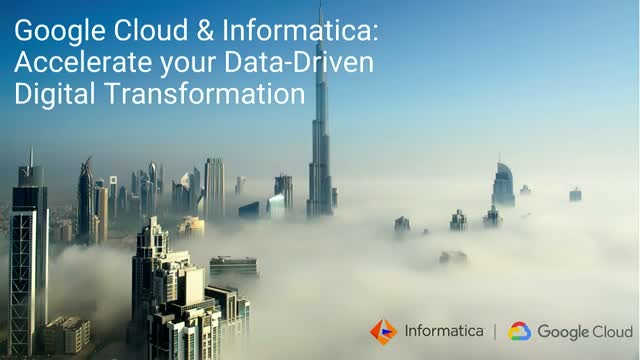 As an Informatica customer you are already using data integration, but did you know that this is just one of many options available to you to fulfill your digital transformation goals? To achieve these, you need to consider new integration patterns such as API-based application Integration, and deliver APIs to your partners, customers and prospects. 2.What Intelligent APIs are and why Informatica is uniquely qualified to offer these? Sunrun, the leading residential solar company in the United States, runs on data. To make customer interactions and business more efficient, the company looked to modernize its data management in the cloud. At the same time, Sunrun faced challenges from a fragmented data and application infrastructure with a growing number of data sources and warehouses. Multiple on-premises data repositories and applications, which are critical to running their business, necessitated a hybrid data and application integration approach. Sunrun embarked on modernization journey with Google Cloud BigQuery and Informatica’s iPaaS to build scalable analytics and a modern API-based data and applications integration architecture on the cloud. Join us to hear about Sunrun’s journey and an update on Informatica’s iPaaS and its integration with Google Cloud. Wearables, connected medical devices and healthcare applications have a large potential to enhance patient experience – both during a trial, and part of a therapeutic programme. Leading pharmaceutical companies have already embraced ‘beyond the pill’ service initiatives as part of a transformation from a product centric sales approach to be an active part of a patient centric ecosystem. Further investment in these service-oriented offerings must both show a clear ROI and gain acceptance by patients and healthcare practitioners alike. To deliver ROI, patients and healthcare practitioners must see clear benefits in terms of health outcomes to maximise engagement with these new digital offerings. The data captured must also be used responsibly, but also deliver insights to pharmaceutical companies to improve products, product delivery mechanisms and treatment compliance – all contributing to improving health outcomes. •Delivering flexibility: Leveraging AI for data discovery and preparation, whilst applying industry standards such as FHIR. •Data privacy: Balance the needs to respect patient data privacy with researchers requirements to deliver value. Business data changes at a fast pace, which makes it a challenge to keep current and enrich existing mastered records as businesses merge, titles change, and locations move. D&B Direct for Informatica, lets you quickly take advantage of Dun & Bradstreet Data and deliver the data structure, connectability, coverage, and quality you need to create and maintain a reliable and consistent experience across your organization and business relationships. In this webinar, you’ll learn how D&B Direct for Informatica can help you achieve a common, trusted view of your business relationships across enterprise workflows in a fraction of the time, enabling better decision-making while decreasing the time-to-value of your MDM investment. Helping you to accelerate data-driven digital transformation with D&B Direct for Informatica. Whether the data is big or small, old or new, traditional or modern, on-premises or in the cloud, data quality is key to delivering the kind of analytics, operational reporting, self-service, and governance that your business requires. This is a can’t miss webinar for anyone that wants an upfront experience with Axon Data Governance and our entire Enterprise Data Governance solution. iPaaS can solve a myriad of integration challenges you’re confronted with when building out a cloud data warehouse. However, traditional iPaaS solutions on the market today can’t address the growing complexity of data management and the multiple integration patterns required for multi-cloud and hybrid data architectures. Join Sebastian Samuel and Nassir Khan as they discuss how Informatica Cloud Data Integration and next-gen iPaaS enabled Bioverativ to create script-free data integrations and syncs between cloud applications and their cloud data warehouse. Healthcare is a highly regulated industry. Before migrating data to the cloud, you must have the right measures and framework in place—including HIPAA and HITRUST—to protect healthcare information and other sensitive data. Replacing an established on-premises enterprise data warehouse (EDW) is not as simple as moving data from an on-premises database to a database in the cloud; healthcare IT organizations require an incremental, well-governed, secure strategy based on a specific provider’s needs to rapidly deliver business results while ensuring minimal disruption to existing applications and analytic workloads. Increasingly, your advanced analytics projects depend on having big data platforms in the cloud. Discover how you can activate a cloud data lake so you can gain transformative insights—faster. Informatica and Qubole have partnered for a joint solution that accelerates your big data pipeline for cloud data lakes. Get a deep dive of the new Enterprise Data Preparation product (formerly known as Enterprise Data Lake) innovations: 50+ advanced data prep functions across various categories such as statistical, windowing, cleansing, transformation, and matching to help data analysts turn raw data into insights. Other key capabilities we will showcase from the 10.2.2 release to help you drive your data lake management initiative include: AI-driven data set recommendations and join & recipe step suggestions as well as increased collaboration among data users in which data analysts add comments, create & save mappings for recipes so then IT can review & operationalize. In fact, 8 of 10 retail leaders believe that immersive technologies are a key component of any digital transformation opportunities but have struggled to get much traction from them to date. This must change, and fast as customers have reported that 61% of them prefer stores which offer augmented reality experiences, 71% would return more often and 40% would pay more for a product if they could experience it in AR. How can these technologies be considered something more than just gimmicks or games? We’ll explore how important information about customers and products can be used to give these technologies staying power. As data becomes the new currency, it’s never been more important to understand your data landscape. At this upcoming webinar, join Michael Lock from Aberdeen, Niraj Revankar from Mattel, and Dharma Kuthanur from Informatica to learn about the value of data cataloging as a foundational capability for any business looking to deliver insights from data. Take a closer look at Informatica Customer 360 Insights to learn how it can help deliver the perspective you need to personalize customer experience and take the next best action across sales, marketing, and service. Join Oliver Soans, product management, and Monica Mullen, portfolio marketing, in this follow-up discussion to the review and demo covered during our Spring Launch event. A business case for master data management (MDM) is more than just a justification to invest in your data. It serves to document and align the organization around both the financial implications as well as the operational aspects of a 360-degree view of your data. In this webinar, you will hear how to succeed in building your business case for a strategic data management initiative. Get a deep-dive into how you can leverage the best of human expertise and AI with EDC 10.2.2. Subject matter expertise and social curation combined with the power of AI deliver a collaborative experience for data discovery, cataloging and management. Big data and data platforms are increasingly vital for your business. With its scalability, agility, and cost savings, cloud is the best infrastructure for building and deploying your data platforms. The cloud’s separation of compute and storage, security architecture, and scalable object stores are among the important capabilities that data platforms need to be built on, in order to increase data lake adoption in your enterprise. Informatica and Qubole have partnered on a joint solution to help activate your cloud data lake by simplifying data ingestion and preparation for your analytics and machine learning projects. The end-to-end solution helps you build and process data pipelines for analytics and AI, from ingesting and preparing data to training and operationalizing machine learning. Watch a deep dive of the new AI-driven big data management and streaming innovations: automatic schema drift handling, so you can adapt to frequent changes in batch and streaming data without impacting processing; advanced Spark support including Python Tx and Spark Structured Streaming; and predictive insights into big data jobs for capacity planning on hybrid, cloud, and on-premises environments. We’ll also showcase other key capabilities from the 10.2.2 release that will help you drive initiatives such as data warehouse modernization and data lake management. You’ll see demos of high-speed mass ingestion that's easy to use, fast, and scalable with no hand-coding, as well as serverless support on a variety of cloud environments including Azure, AWS, and Google Cloud. Cloud Data Warehouse is a key component of analytics modernization, so you can enable data-driven business decisions. Join Harsha Kapre, Director of Product Management at Snowflake Computing and Informatica's Puneet Gupta, VP Product Management iPaaS & Cloud Platform and Amol Dongre, Director of Product Management, for a deep-dive exploration of our joint solution. We will discuss how together we help infuse analytics solutions with cloud agility and scale, rapidly curating multi-cloud and on-premises, trusted and relevant data in a cloud data warehouse. We will review key use cases and typical adoption patterns we are seeing in the market for cloud data warehouse. Our experts will discuss in detail key features of our joint solution as well as a reference architecture and recommended best practices. We will also provide a high-level overview of leveraging an AI-driven catalog to identify enterprise-wide data assets for cloud migration and empower analysts with data discovery. Finally, learn how Informatica and Snowflake help you govern and secure data, not only for analytics, but also for data sharing so you can unleash the power of new data economy. Our session will include a demo of our joint solution. Are you aware of the crucial role data deletion plays in data privacy compliance? Join Informatica and Cognizant for a short interactive webinar session: Implementing Data Deletion – A Vital Element in Data Privacy Compliance. This interactive session will end with a live Q&A, so you can learn from data deletion experts at Cognizant and Informatica. Plus gain insight into the Right of Erasure (right to be forgotten) and Retention / Data Minimisation and the difficulties organisations have met of which can severely impact an operational business if not done correctly. The great news is we are here to support you with a proven solution to deliver a scalable data deletion approach, leveraging advanced technology and processes to ensure data deletion is achieved safely, while returning value to your organisation beyond compliance. Digital transformation changes expectations: better service, faster delivery, with less cost. Businesses must transform to stay relevant and data holds the answers. As the world’s leader in enterprise cloud data management, we’re prepared to help you intelligently lead—in any sector, category or niche. Informatica provides you with the foresight to become more agile, realize new growth opportunities or create new inventions. With 100% focus on everything data, we offer the versatility needed to succeed. We invite you to explore all that Informatica has to offer—and unleash the power of data to drive your next intelligent disruption. Informatica is the only Enterprise Cloud Data Management leader that accelerates data-driven digital transformation. Informatica enables companies to unleash the power of data to fuel innovation, become more agile and realize new growth opportunities, resulting in intelligent market disruptions. With over 9,000 customers worldwide, Informatica is the trusted leader in Enterprise Cloud Data Management. For more information, call +1 650-385-5000 (1-800-653-3871 in the U.S.), or visit www.informatica.com.